Corey Albrecht is a senior from Algonquin, Illinois, studying civil engineering. 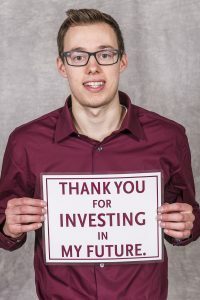 He is a recipient of the SIU Dean’s Scholarship, SIU College of Engineering Scholarship and Waldemar J. Klasing Foundation Scholarship. Why did you choose SIU? I chose SIU because of the quality of the College of Engineering, the beautiful campus and region, the low cost of tuition, the scholarship opportunities, the proximity and ease of transportation to the Chicago suburbs and the dedication that students appeared to have on campus visits. What inspired you to choose your area of study? I had always been good at math and science classes in high school, and I always had an interest in the structure of buildings and bridges. What is your most memorable experience at SIU? My most memorable experience at SIU was probably the scholarship luncheon this year. It was inspiring to see so many generous donors, hardworking students, SIU faculty and administration coming together to celebrate the successes of the university. It was basically all of the great components of SIU coming together to meet each other for a great meal and presentation. I really enjoyed the interaction with donors. What do you brag about most when you tell your friends about SIU? I mostly brag about how beautiful the campus and region is, the weather here compared to northern Illinois, the outstanding professors in our civil engineering program and our sports teams when they are doing well. Could you tell us about the impact of the scholarship on your education at SIU and your life in general? Scholarships have relieved a significant amount of financial stress from my life. This has allowed me to focus more on my courses and RSOs, and it has motivated me to perform better in my courses. It has also impacted my family and relieved financial stress from them, which is very important to me. Why should people consider donating to SIU? Donors, in my opinion, are probably the most important contributors to the health and strength of SIU. Scholarships assist in growing enrollment, give opportunities to students who would not be able to afford college and are role models for SIU students. Seeing individuals and couples who graduated from SIU and became successful motivates me and other students that one day we can accomplish the same level of success. Donors are role models to students and allows students to accomplish more with their help. This results in better students graduating from SIU and a higher quality alumni base. If you had $1,000 to donate to SIU, what would you like to see that money benefit? Why? I would like to see that money benefit the RSOs in engineering. From working with and being a part of Steel Bridge Team and ASCE, and seeing students in Baja and Robotics, Engineering RSOs consist of some of the brightest, most dedicated and hard-working students at this university. Engineering RSOs are essential for students obtaining hands-on experience in their field. This entry was posted in Higher Education, Illinois Higher Education, Scholarship Recipient, SIU by admin. Bookmark the permalink.